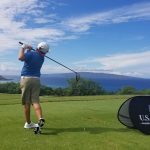 Sentry, the title sponsor of the PGA’s Tournament of Champions (TOC) in Kapalua, is an insurance company out of the midwest. 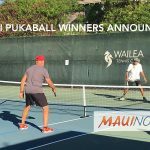 Yet, even with so many miles between us, leaders say they’re more committed than ever to supporting Maui as it hosts some of the world’s best golfers. Crews are hard at work at Kapalua’s Plantation Course, constructing grandstands and making sure everything is in its right place for the Sentry Tournament of Champions, which spans January 2 to 6, 2019. The event will host around 35 golfers, all winners from different tournaments throughout the PGA season. “Our guys are really great about interacting with fans, and we’ve got some really great personalities out there; guys that are a lot of fun,” explains Alex Urban, general manager of the Sentry Tournament of Champions. As one of many examples, Rory McIlroy is competing for the first time at the TOC. He’s considered one of the most popular golfers on the planet, and he’s bringing a whole team of family fans. During the tournament, fans will enjoy some new additions, like a well-equipped entry at the 2nd hole, with a Sentry swing simulator and more options for eats, including food trucks and shave ice stands. Learn more about what’s happening in our video above. They’re also creating some special events, like a community day on Sunday, Dec. 30 in Lāhainā, and an Aloha-themed day of competition. Last year, golfer Ricky Fowler wore a traditional, untucked Aloha shirt on Thursday of the competition, which lit up social media. So TOC officials were inspired to broaden the theme, by declaring January 4 “Aloha Friday” at the course. “Staff will be wearing Aloha gear, as will volunteers and we’re working with players too, to kind of build on what Ricky did,” adds Urban. PGA tournaments give all excess proceeds back to the communities that host them. Here’s that means more than $6.3 million raised for Hawai‘i non-profits since 1999. There will be free public parking at Lāhainā Civic Center, with shuttles rotating to bring fans to the Plantation course. And for the first time, the TOC is working more closely with Uber. Get more details on the event and tickets at the Tournament of Champions website.